A pearl hidden in the Caribbean, Christopher Columbus named Nevis from his first sighting of the island in 1493. The island's cloud-capped volcanic peak reminded him of snow, which is called nieves in Spanish. 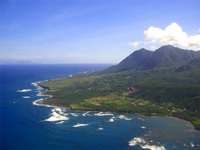 Small and round, Nevis is only about seven miles (11km) long and five miles (8km) wide. It's an unspoilt and serene island that's a delight for nature-lovers and those seeking an escape from the modern world. Its single volcanic peak rises 3,232ft (985m) above verdant rainforest filled with tropical flowers and animals, and the beaches and clear waters that surround the island provide the ideal holiday environment for swimming, sunbathing, and underwater exploration. During the 18th century Nevis gained wealth from its sugar industry and became known as the Queen of the Caribbean sugar islands. Its social life became as decadent as it was extravagant. Today, grand estate houses and once lavish hotels lie in ruins and sugar plantations remain untouched since the decline of the once coveted trade. The charm of its small towns, the genuine hospitality and friendliness of the people, and the laws controlling over-development and natural conservation attracts visitors today. Lavish manors have been preserved and rank among the best plantation inns in the Caribbean, and architectural gems and historical relics promise hours of exploration amid the natural splendour that covers the island. Today, Nevis has a reputation for elegant living, with one of the world's most exclusive resorts and spas, golf courses, a variety of restaurants and bars, and beautiful gardens and beaches. A vacation in Nevis is sure to recharge any traveller's batteries.